For those of you who have been following 7 year old Frankie's #rhinosUP campaign, you can now create your very own rhino moneybox to start fundraising! Frankie designed it with his Nana. Instructions and templates for creating the box can be found at the link below. We're looking forward to seeing what creative designs you come up with! In recent years I have become increasingly concerned about the rate at which we are losing our rhinos. By ‘our’ I mean collectively, as sentient beings on this planet. At the beginning of the 20th century, there were half a million rhinos roaming the world. As it stands, there are fewer than 30,000 (all species combined). If we were rhinos, all of us would fit in Leicester City's football Stadium, and there would still be room to spare. Since 2014, South Africa alone has lost almost 3,500 rhinos to poaching. That’s over 3 a day. Each time we all sat down to a meal in the past 3 years, South Africa lost another rhino to crime. Our species has driven this dramatic decline, and we will be the poorer if we drive them to extinction. As a trade, rhino horn has always baffled me. Outdated beliefs in horn possessing medicinal qualities have been unequivocally quashed by science. A rhino horn is made from Keratin - the very same protein that makes up our fingernails, hair and the outer layer of our skin. Consuming large quantities of it will, at best, give you an upset stomach. South Africa recently made legal a domestic trade in rhino horn, in the hope of crushing the illegal trade and bringing down the value of horn. I am not so optimistic. Legitimising the trade only gives poachers and traffickers a veil to hide behind when illegally laundering horns, and it sends out mixed messages to the rest of the world which overwhelmingly backs a ban. Do we really want to set a precedent where rhinos are farmed like cattle? And for what? The horn is of no benefit to humans, only rhinos. It is up to us to act as guardians not owners, and it has been shown that we can still protect rhinos in the wild if we set our minds to it. Many artists do what they can to help protect wildlife. I drew this piece to draw attention to this brutal trade, and create something that could shock and make people think twice. When it was shortlisted for the final of the DSWF Wildlife Artist of the Year exhibition, I was asked to put a price on it. There was only one valuation in my mind. £48,000 - the price of a single rhino horn on the black market. Any purchaser of the Wildlife Artist of the Year exhibits is supporting the conservation work of the David Shepherd Wildlife Foundation. Any purchaser would be investing in conservation and creativity as an antidote to those purchasing rhino horn and fuelling the decline of rhinos across the world. Mind boggling figures get banded about so readily these days that the impact of £48K for a rhino horn gets lost in 10 figure divorce settlements for Brexit, or the price of Kim Kardashian’s new earrings. I want people to be shocked when they see the price of this artwork, no bigger than an actual rhino horn. The harsh reality is that there are many people in this world who will happily pay that to acquire a horn. For whatever delusions of grandeur or medical immortality, ultimately all you end up with is another dead rhino. In a rapidly growing online world, where the speed at which we consume our news is ever on the rise, visual content is key to grabbing people’s attention. While few could purchase this piece at this price, everyone can help spread the word and give the plight of rhinos the oxygen of publicity. We can all spread the word, provoking thought and discussion about the value we ascribe to wildlife dead or alive. 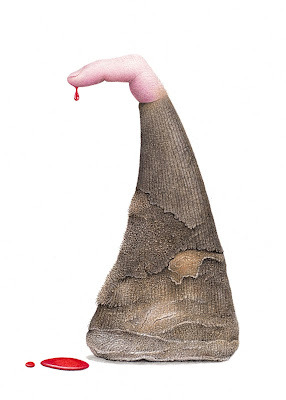 My hope is that this piece will earn its value from the awareness it generates about this bloodthirsty trade. 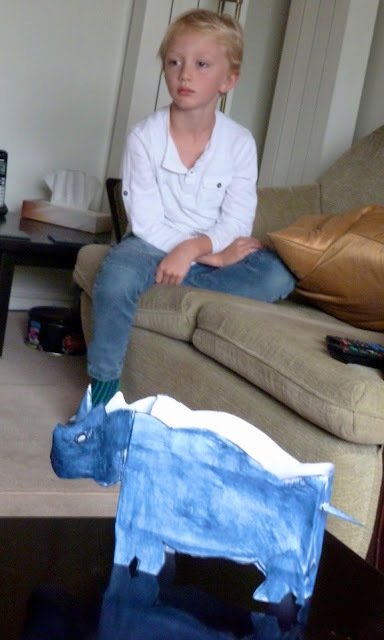 A couple of months back I was visiting friends and sat making playdough rhinos with their 6 year old son, Frankie. We talked about the northern white rhinos and the fact that there are only 3 left in the world. Some weeks later Frankie’s mum got in touch to say that it had been on his mind and he wanted to do something to help. In his words, he wanted to help "make a baby rhino". So he came up with the ‘Rhinos UP’ project to try and raise funds for the Ol Pejeta Conservancy’s ‘Most Eligible Bachelor’ campaign. Frankie's vision is to build a huge flowerbed in one of their local parks, designed in the shape of Sudan - the last male northern white rhino on earth. The proposal to his council in Cambridge involves planting native bee-friendly flowers and he is currently out knocking on doors in the community to gather support for his idea. I am backing Frankie on this project because the only positive result for rhinos relies on the next generation taking up the mantle and being the wildlife guardians of the future. Witnessing such passion and understanding in someone so young must only be encouraged. Frankie is my Young Wildlife Champion of the Year! Watch this space for more about #RhinosUP and ways to get involved. I recently found out that all three artworks I submitted to the DSWF Wildlife Artist of the Year have been shortlisted for this year's event in June. With a record number of entries this year, I'm both shocked and delighted. Dates for the exhibition are listed below. If you can make it to the London Mall Galleries during this time, I'd highly recommend dropping by. Going on previous years, the standard of work on display is intimidatingly good! 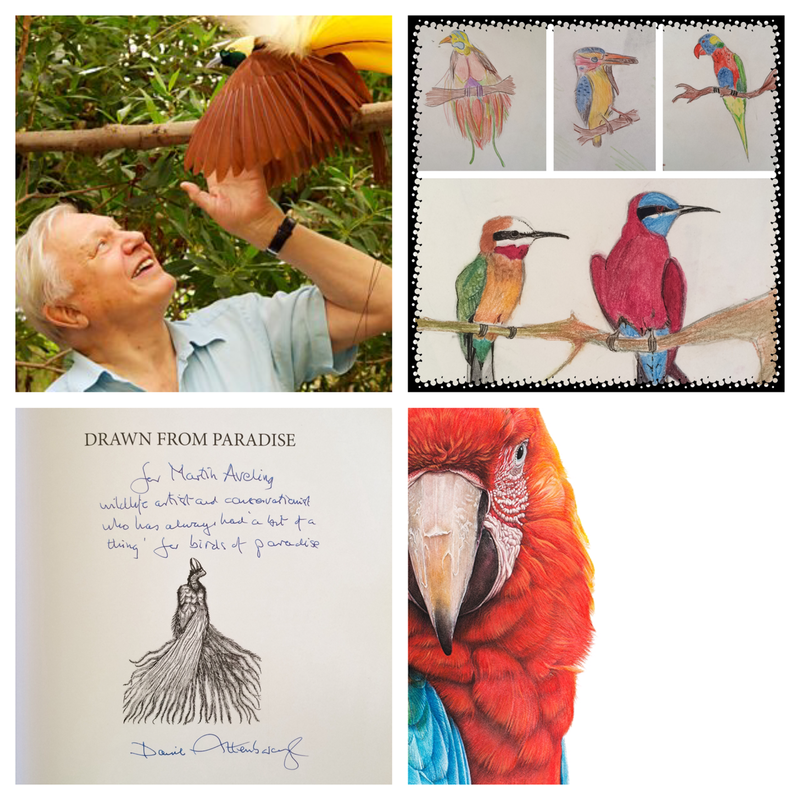 50% of all profits also goes towards supporting wildlife conservation projects. Interviewed by Alfie, aged 9. Last weekend I was contacted by Alfie from Thorndown Primary School in St Ives about a homework assignment to research a local artist. I was flattered he picked me, and really enjoyed reading his questions. 1. Which animal inspired you the most? That’s a great first question, and actually one of the hardest to answer. If pushed, I would probably have to say the great apes. My parents began their careers as primatologists, working to set up conservation field programmes for orangutans in Indonesia. Following this they moved to Africa to work with mountain gorillas, and subsequently decided to have some little apes of their own! Mum often says that working with gorillas and orangutans was “the perfect preparation for being a parent”. I can’t speak for my brothers, but I take this as a big compliment. Having been lucky enough to spend time with mountain gorillas, it was apparent to me just how much like us they are. I’ve certainly never felt more acutely aware of being observed by a mountain gorilla than by any other animal. Growing up hearing stories about their red cousins in Indonesia, it was a long-lived ambition of mine to visit orangutans in the wild, something I was able to achieve a few years back with a bursary from the Society of Wildlife Artists. As much as orangutans and gorillas are like us in many ways, their numbers tell a different story. Both the Bornean and Sumatran orangutan are now listed as ‘Critically Endangered’ on the IUCN Red List of Threatened Species. It's the same unwanted title for the mountain gorilla whose species numbers as few as 900 individuals. Humans are largely to blame and I feel sad and ashamed that we are the ugly cousins in this scenario. These amazing animals inspired me to engage with wildlife and record it on paper, something that has brought me immense joy all throughout my life. So I feel a certain responsibility to try and give them a fighting chance by promoting their cause where I can. 2. How does it feel being famous? I’m not sure I’d go that far. I certainly don’t get stopped in the street for selfies! Perhaps in wildlife art circles I’m now a little better known, and that is largely down to social media. I feel very privileged to have so many people interested in my work, and I read all the comments and try to engage as much as possible. I put the work out there because I want it to be seen, so I like to hear what people have to say. Feedback can also be very useful if you keep a level head. I will always make a concerted effort to leave plenty of time for drawing though. One of the best things about having this audience is being able to talk about wildlife conservation. I try not to preach, although I'll admit I am guilty of this at times! More often, I'll just try and put the information out there for people to digest as they please. I'm aware that my Facebook and Instagram pages are promoted as art sites, so I try and keep it relevant by attaching information to a piece of artwork or recent work in progress. If I can encourage even just one person to engage with wildlife conservation, that's a positive difference I wouldn't have otherwise made. 3. Where was your favourite exhibition and why? Probably my first ever solo exhibition in Nairobi. Other than taking part in art exhibitions at school, I’d never done anything like it before. It was a daunting prospect, but the reaction was fantastic, and it even ended up selling out. The exhibition was called “Metamorphosis”, and turned a spotlight on some of the world’s smaller animals like butterflies, other insects and some reptiles. I was aware that a lot of people may have bought work to show support - the nature of the Nairobi community is to look out for friends, like all good social creatures do! However, I will always be grateful to those friends and family who attended and bought work, as it gave me the confidence and desire to host further exhibitions. Although it wasn't until after university that I decided to try and be a full time wildlife artist, that first exhibition was a formative moment in eventually leading me there. 4. What was your first ever drawing? I honestly can’t remember, as I was very young when I first picked up a pencil. I would imagine it was probably something with scales, fur or feathers though! 5. How old were you when you did your first drawing? There must have been reams of pages with early doodles of mine that never made it out of Africa, but the earliest one we have is this piece of homework from kindergarten where the task was to draw anything we like. This was in February 1988, so I would have been 5. I drew some swimming ducks, and what I think is a boat rudder, deduced from vague but fond memories of living on the shores of Lake Kivu in what was then Zaire (now the Democratic Republic of Congo). I know it looks a bit like a hammer though! My aunt recently brought back a folder with lots of drawings and paintings I did when we lived in Kenya, including the first time I appeared in the paper. The acting career was a lot shorter lived than the art one! I guess drawing became a bit of a compulsion. 6. What are your main materials / tools which you use? I now work almost exclusively with pastel pencils. My mum bought me a set of Derwent pastel pencils for my IGCSE art exam and I was instantly hooked! I love the range of colours they offer, and the ease with which you're able to blend them together to create more natural tones found in nature. I also enjoy the level of detail one is able to achieve by sharpening the pencils to a fine tip. They're a soft medium, and being so obsessed with detail as I am, I do spend quite a lot of my time sharpening! I enjoy the softness, however, and like to use my fingers to move the pigment around the page. My technique is to build up layers of colour and detail, using a light spray of fixative as I go. The detail recedes slightly with each spray, but then re- working on top of the sprayed area with the pastels makes it re-emerge with embedded texture. I find it's good practice not to spray too often, as it can lead to the surface becoming waxy and harder to work over. To avoid this I lay the work flat on a desk and spray horizontally above it, as opposed to spraying directly at it. That way the fixative rains down on the page and doesn't dissolve the detail as much. The pastel pencils are a versatile medium, and I'm still discovering things about them I wasn't previously aware of, even after using them for over 20 years! The lengthy nature of the process does mean I have to reflect the time invested when pricing my work. Hopefully people feel it's worth the wait, as I do. My favourite pastel pencil colour was always Terracotta, which reminded me of the colour of the soil in Kenya. I found I used it a lot in my early work. Having said that, I vividly remember the first time I caught sight of a Papilio zalmoxis butterfly's flash of florescent blue, or the surprising deep red feathers of a Hartlaub's turaco flying over. 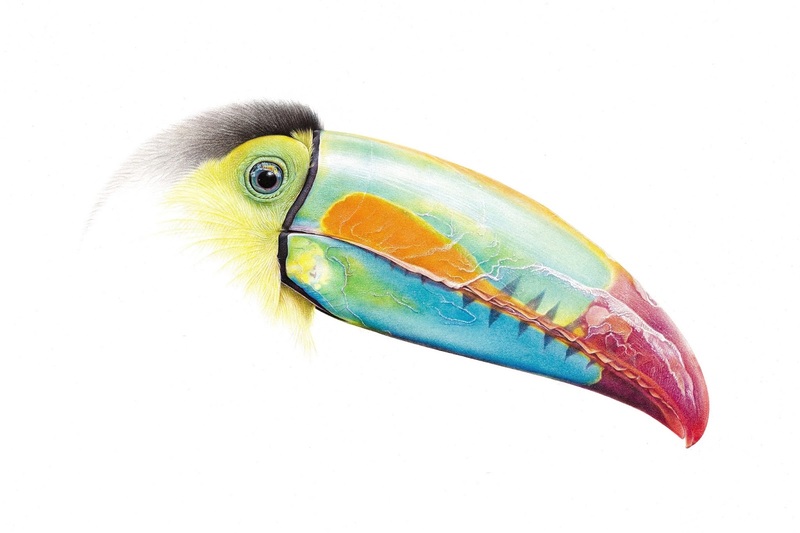 I love trying to recreate those vivid sights in pastel pencil, and recently started work on a toucan, which is giving almost all my pencils a work-out. 8. How did it feel being a part of the Elephant Parade? I really enjoyed being part of Elephant Parade. It was flattering to be invited to produce a piece of public art to sit in the middle of London for 2 months during the summer, with the aim of raising awareness for the endangered Asian elephant. Hats off to the Elephant Family for an incredibly successful campaign that raised over £4million to help create space for both elephants and people across Asia. Being so large, elephants require vast areas to roam in order to achieve basic life functions. Having to traverse heavily populated and developed areas has meant that humans and elephants are more regularly coming into conflict, often with fatal consequences on both sides. It's not an easy job to deal with, but it was humbling for me to spend time working with great people who care enough to give it their all and make a difference. 9. How did you decide on your elephant design? One of the games my brothers and I played when we were kids was to give each other pieces of paper with a few squiggles on, and then from those we had to draw something. It was a lot of fun, and also good training. I approached my elephant design in the same way, although being 3D it was a bit more challenging. I eventually landed on the polar bear design, and called it "Nanook", which relates to the Inuit word for these bears. I hoped that people would maybe think about climate change and how it affects all animals, elephants and people included. 10. What are you most proud of to date? On a personal level, I'm proud to be getting up everyday and doing something I've enjoyed doing for most of my life. I was exposed to wildlife and given the tools to draw it around the same time I was learning to walk and talk. I'll always be grateful to my parents for this early intervention. When I hear from young people showing an interest in wildlife, it gives me a great deal of pleasure. People like Jane Goodall and David Attenborough are great wildlife champions, and have been for many years. They are still dedicating their time to promoting the plight of wildlife and our planet, and it's no coincidence that they, and many others in their line of work, were all exposed to the natural world at a young age. Those big shoes will need filling, and it will be down to the next generation to take up the mantle and be the wildlife champions of the future. If something I've drawn inspires a young person to get more involved with wildlife, that makes me feel very proud. So the short answer is, this! Few people have done more for promoting the plight of wildlife and the environment than Sir David Attenborough. He certainly inspired me from a young age, introducing a sense of curiosity and wonder for the spectacular diversity of life our planet has spawned. My life has been more colourful as a result, reflected in my art over the years. I am grateful to share just a small stake in an enduring legacy, which has influenced countless wildlife artists, biologists, explorers, film makers, conservationists and more. Today at 90 years of age, he continues to inspire generations. Happy birthday Sir David!